Indeed time flies…the past months have been busy jumping across continents, starting a new life, juggling jobs and pursuing new endeavors. Sounds more hectic than exciting, which makes me wonder when was the last time anyone had time to spare or was not “too busy” to evaluate what is happening on a day to day basis?People constantly strive to break the norms, lead a better lifestyle, and safeguard a promising future. What about the simple things that happen each and every second? Modern citizens rarely allow themselves to enjoy plain moments because they are tangled in a restless effort to meet the social contract they de facto agreed to upon birth. Remember to be thankful for what you have! That’s right learn to appreciate what you have already gained! Most of the times you just take things for granted and ask for more, which is not always what you want but what you think is good for you. In a highly connected world, the information flow constantly creates new cravings without real substance, and though marketing is powerful, you too have the power to make choices. Between absolute minimalism and hyper-consumerism there is a silver lining. The picture of this young boy buried among 38 historic pictures worth seeing reminded me of the small joys of life I have been missing for years. 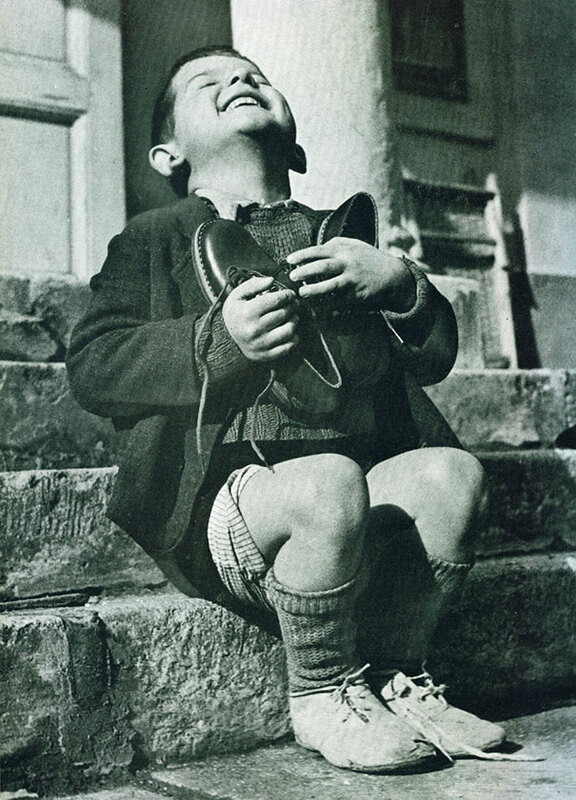 The obvious contentment for a new pair of shoes may not apply in a shopaholic society but it is a strong reminder of how does being grateful should feel like. After all, maybe time doesn’t fly, maybe we just choose to waste it worrying about things we can’t control instead of appreciating what we already have…and trust me its a lot!